If you follow my Instagram account, then you know that I went through a transformation in the past two years. Yes, I lost the 20+ lbs of baby weight I’d held on to for 2 too many years, but I also, along the way, changed my entire life! I’ve discovered a new passion for health and wellness. It all started by showing up for myself every day. I’ve got a new opportunity for you to take the same path I did and transform your life as well. Given the name of this program, that sounds a bit cheesy but it’s no less true. 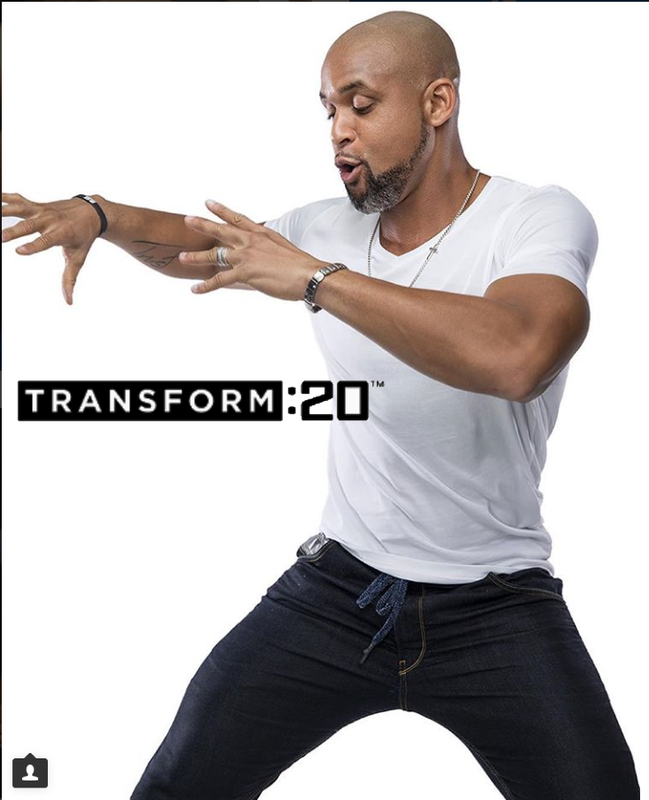 TRANSFORM: 20, the new program by Shaun T is going to transoform a lot of lives, through only 20 minutes of workouts each day. IT'S ALMOST TIME!!!!! The early launch group for Transform: 20, ShaunT's new 20 minute program, starts right after the holidays, but the VIP Early access and step for the program go on sale Monday and they are going to SELL OUT fast. I've got all of the information you need to commit to your continued journey to be your healthiest, happiest self in the New Year. Transform :20 is a fast, super-intense fitness program created by Super Trainer Shaun T that will transformyour body - and your mind - in just 20 minutes a day, 6 days a week over 6 weeks. Be forewarned - it's hard. But the results will be worth it. Transform :20 is a breakthrough total - body workout without breaks. It's just you, Shaun T, and a Step. After 5 minutes, you'll be out of breath, at 10 minutes you'll be sweating, in 15 minutes you'll belooking at the clock, and by minute 20 you'll be done. You'll blast your core, legs, glutes, and upper body - no weights required. There's a different workout every day, 6 days a week, done in real time with the cast. No do-overs and no repeats. And yes, each phase will start to get harder, but there is a modifier so you can grow with the program! In addition to the 32 unique workouts Shaun has for us, you will also get access to 6 bonus workouts with weights and 4 bonus cardio workouts that you can add to your 20 minute commitment if you feel you need or want more some days. Follow either containers from 21-day fix, 2Bmindset or the transform nutrition guide that comes with your package of information, tells you according to your weight and goal weight, how much of what to eat, a recipe book from ShaunT is included and a tracker....THE TRACKER. You guys, I saw the tracker and can't wait. It's a journal for each day you mark off your water intake, your weight, breakfast, lunch, dinner, shakeology (if applicable), coffee, how many hours you slept and how you feel overall and the best part, each day you check if you laughed or not. I love that! This program is literally so up my alley and it's going to be the most amazing way to start the new year! I can't wait!!! Each day also has a ShaunT motivational message to keep our head in the game. Along with all of that, you also get a decal wall calendar, you can use a dry eraser so that you can re-use it for the next time you do the program. You get 3 stickers to stick onto your step for each phase you complete. In addition to the accountability group I'll be running for us, ShaunT has a VIP launch group. This will be a private fb group for everyone to go through the 6 weeks with him. He will be going live, posting every day, you are essentially going to be able to connect with him, ask questions, he has an agenda planned out to help all of us through this and to get the most of it. In order to get into this group, you have to be a coach or discount coach (aka, getting the coach discount without having to coach) and you obviously have to purchase the early release program. IF you are not a discount coach and would like to sign up just for this program, I can do that for you as well. Just let me know and I'll make a note to add you. If you already have Beachbody on demand, there are completion packages, which also allow you to try shakeology just for these 6 weeks to help maximize your results. Or (Performance line: recover, hydrate or energize, because who doesn't need energize to get through a ShaunT program) There will be $20.00 off of those challenge + completion packs for the month of December. So a great time to get a major discount if you have been thinking of trying any of the products. December 4th is the first day the internet is going to be bursting so I want to make it simple for you to place your order. If you know you want in on this program, mark your calendar now and stay tuned for the sale launch on Monday!. I'll send out an email when everything is live and ready for you to order. I can even help you order to be sure you get the right thing. If you have questions, email me now so we can get them answered this weekend. I will have carts individually created for you and sent out on December 4th, so all you have to do is open your email. I'm SO SO SO excited for this program, it's going to help the winter fly by, and all of us to head into spring healthy, happy and strong (mentally and physically). My group will officially launch JANUARY 7th. We’ll use that week before the workouts begin to be sure we’ve all got a solid nutrition plan in place and all questions are answered. Let's have some fun, enjoy some short but very much to the point workouts and enjoy the holidays knowing we already have a plan set in place come January. PLEASE FILL OUT THE FOLLOWING FORM TO GET YOUR JOURNEY UNDER WAY TODAY!